I enjoy a good plot-driven romance in the books I read but what really pulls me in and holds me are the characters. Give me complex characters who engage my interest and my emotions and I'll keep coming back for more. That's a key reason why I've been a fan of Susanna Craig's stories since reading her debut, To Kiss a Thief, two years ago. In The Companion's Secret, Craig has crafted a hero and heroine in Gabriel and Camellia who captured my interest immediately and held it throughout their story. There's depth and honor in both of them even though circumstances throughout the years have caused Gabriel to bury his goodness deep inside and let society see what they expect from him. Gabriel's best friend, Christopher Fox and Camellia's cousin, Lady Felicity are well-rounded secondary characters who add an extra layer of complexity to the story. I especially enjoyed the ways in which Felicity moves the story forward, both for herself as well as Gabriel and Camellia. All of the main characters in this book - both good and bad - are brought to life on the pages, creating a strong emotional response from this reader. Of course, it's not only about her realistic and relatable characters. Craig also has the ability to craft engaging, Georgian-era stories with well-researched historical - and geographical - accuracy that keep me reading late into the night. When I begin one of her books, I can count on characters that speak to my heart, a story that engages my emotions, and a history lesson that doesn't feel like one. It is any wonder that I eagerly anticipate each new book from this talented author? 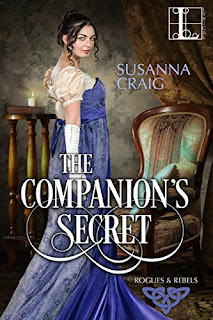 I thoroughly enjoyed The Companion's Secret and am already looking forward to Camellia's siblings' stories in the next two books of Susanna Craig's Rogues and Rebels series. If you have not yet read Craig's first trilogy, all three books are currently on sale at reduced prices for digital format. Check the blog's right side-bar for purchase links. Welcome to The Romance Dish, Susanna! It’s great to be here, PJ! Thanks for having me. The Companion’s Secret launches your new Rogues and Rebels series (I've already read it twice and loved it). What should readers expect from this series? What can you share about future books in the series and when do you expect them to be published? The Rogues and Rebels series follows the adventures of the Dublin-born Burke siblings. Love is the last thing they’re looking for—particularly not with someone who’s English—so of course, that’s exactly what they find! I’ve just finished the second book, The Duke’s Suspicion, in which younger sister Erica Burke, a botanist, finds herself trapped by a storm with Major Tristan Laurens, the unexpected heir to a dukedom, who mistakes her for a spy. That story will be out in December 2018. The third book, eldest brother Paris’s story, will be available in 2019; I’m still in search of the perfect title. Oh, good! I was so hoping Paris would have a story and the sneak peek at Erica's story (at the end of The Companion's Secret) already has me excited for book two! This book is set in England and Ireland during the late Georgian era. What is it about this period of history that compelled you to set your story there? the Regency, a slight twist on a period that’s familiar to a lot of historical romance readers. It’s the decade in which Austen wrote (and set) Sense and Sensibility, Pride and Prejudice and Northanger Abbey. And when I think about what’s happening in her early books—war and riots and social upheaval are always at the margins, characters’ emotions and passions run high, Gothic novels are wildly popular—I see a lot of possibilities for the stories I want to tell. The Rogues and Rebels series takes place during the years surrounding the 1798 Rebellion in Ireland, which leads directly to the 1800 Act of Union, joining Ireland to Great Britain to form the United Kingdom. Believe it or not, contemporaries described it as a “marriage,” although if it was, I’d say it was definitely an enemies-to-lovers romance! The dogs in this book were some of my favorite secondary characters. Do you share your life with any four-legged family members? Were any of them used as inspiration for the canine characters in your book? Right now my only four-legged companion is a ridiculously fluffy torti cat named Nutmeg who resents every moment I spend at the computer. But I grew up around dogs on our family farm and I’m sure they have influenced the dogs that inhabit my stories. 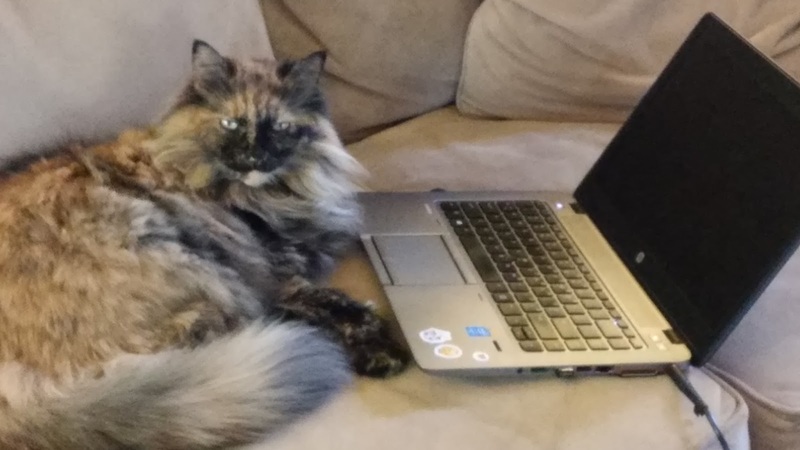 Pets are such an important part of many of our lives today that it seems only natural to make them part of my characters’ lives too. I loved the scenes where Camellia reads her novel to Gabriel. What were the challenges in writing a novel written by your heroine within the novel written by you? Those scenes were a lot of fun to write! I wanted Cami’s writing “voice” to be different from my own, so I thought a lot about the style of novels actually written in the late eighteenth century—as an English professor with a specialty in the literature of the British Romantic period (1780-1830), I have plenty of experience with such books! In particular, I used the work of Sydney Owenson and Maria Edgeworth, two Irish novelists of that period, as models for the kind of book I imagined her writing. Though I do not have Irish ancestry, I claim honorary status because I was born on St. Patrick’s Day! So it’s always a dual celebration at our house, and this year we’re also having my daughter’s 8th birthday party on that day, so you know it’ll be the craic! Though it’s not necessarily traditional St. Patrick’s Day fare, my favorite Irish meal is stew and soda bread. The banter between Cami and Gabriel was so much fun—they’re both quick-witted characters who speak their minds. Have you ever experienced the agony of thinking of the perfect thing to say 10 minutes too late? One of the best parts about being a writer is that your characters never have to suffer through that! They always come up with the perfect line at the perfect time. (Never mind how long the writer had to struggle…) Sometimes, however, a character’s sharp retorts and sardonic smiles hide something painful in his past. The most difficult scene to write in this book was definitely when Gabriel tells Cami about his childhood. I loved the banter between these two! The scene where Gabriel reveals the secrets of his childhood had me in tears. It may have been your most difficult to write but you certainly did it justice. Spring Break is almost upon us. If money and time were no issue, where in the world would you choose to spend your break and what would you most want to see/do while there? Good question! Right now I think my ideal vacation, wherever it took place, would involve lots of peace and quiet and naps! And when I was fully rested, who knows? My daughter is lobbying for Harry Potter World and I have to say that sounds like fun! Thank you for answering my questions, Susanna. Do you have anything else to add? Would you like to ask our readers a question? Thanks again for having me! Since you mentioned St. Patrick’s Day, which is tomorrow, I was hoping readers would share their favorite “minor” holiday and tell us how they celebrate. Giveaway: Your choice of a signed copy of The Companion’s Secret (US only) or the entire Runaway Desires series AND The Companion’s Secret in e-book. Winner will be randomly chosen from all comments posted before 11:00 PM (Eastern), March 18. A new to me author - sounds good. Both my husband and I work on St. Patrick's Day but I will at least wear green! You definitely have to wear green--hope it brings you lots of luck! This novel sounds unique and special. A holiday we enjoy is Purim. Thank you! And thanks for visiting today. Thanks for the giveaway. I like when a book has dogs in the plot. They have their own personalities. A minor holiday that I celebrate would be St. Patrick's Day. I try to wear something green and cook something with cabbage. A big part of my ancestry is Irish so, of course, I celebrate too, Kim. And, as I said in the post, I love corned beef and cabbage! Thanks for stopping by! And Happy St. Patrick's Day! Thanks for a great review, PJ. I went to southern Ireland for my nephew's wedding a few years ago, and I was blown away by how beautiful it was. I don't really celebrate any minor holidays. 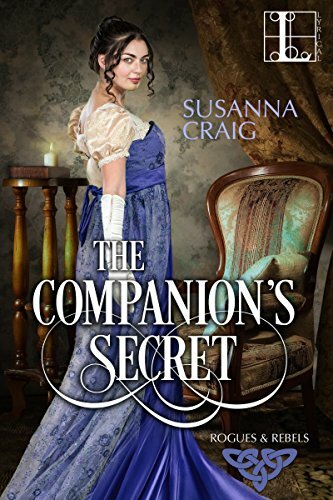 Susanna is a new Author to me, and I would love to win a signed print copy of The Companion's Secret. Thanks for stopping by, Diane! Isn't Ireland a lovely place? I hope I get to go back someday. The Companion's Secret would be very enjoyable since it is brilliant. Our most fun holiday is Chanukah. Thanks for stopping and saying hi! Chanukah seems like an amazing celebration. Mardi Gras is my favorite holiday. It’s minor to most of the rest of the country, but not where I’m from (south Louisiana.) I love the fun-loving atmosphere; the food, music and parades; and most of all, I love watching children enjoy everything Mardi Gras has to offer. Thanks for the post and giveaway. I've only been to New Orleans once, and not at Mardi Gras, but it was wonderful and I can only imagine what the celebration is like there! I'm from the upper Midwest originally, so we celebrate with paczki. Oh Yes! Another new to me author. And when I read that the characters have wonderfully entertaining conversations....it makes me fall in love with a book. I like heroines who are challenging and heroes who take up that challenge. Thanks for the review as well as the interview. Thanks for stopping by--good luck in the giveaway! Happy St. Patrick's Day! My favorite, wearing of the green, parade, corned beef sandwiches and green beer! What more can you want? Maybe your great book. Thanks for the chance. Sounds like a great way to spend St. Patrick's Day! My favorite minor holiday is Sweetest Day. You do small things for your love ones. Ah, that's a lovely one, especially for those of us who love romance! I don't know if Valentine's is considered a "minor" holiday, but I love to give small gifts on that day to my best girlfriends (not just my hubby and children)...one of my favorite days of the year! Susanna is a new-to-me author, and I'd love the chance to win! Valentine's Day is a great day to celebrate love of all kinds! I don't know why I wasn't aware of Susanna Craig's books until now! Hope you'll enjoy them! Good luck in the giveaway! Happy Birthday! Enjoyed the interview. Thank you! Hope you have a wonderful St. Patrick's Day! Happy Birthday ! Being half Irish we do it big, parades,big family meal with corn beef & cabbage, Irish stew and my favorite soda bread. A new Author for me and look forward to reading this book. That sounds like great fun, Carol! I just added this to my TBR! Thanks for the interview! Yay! Happy St. Patrick's Day! The women's group of my parents church would put on a St. Pat's Day dinner of ham loaf and various sides for a fixed amount.. Eat there or carryout.. There were some awesome cooks and bakers in those women! Good country farm cooking. I wish we lived closer than 3 hours away!! Thank you, PJ! And thanks for having me at the Romance Dish! Sounds like a book I'll enjoy. My favorite holiday is Halloween I celebrate it all month. Halloween is so much fun for kids and grownups alike! St. Patrick's Day is our favorite Minor holiday. We do have Irish roots and celebrate them. We usually do the traditional corned beef and cabbage with soda bread. I have done a beef stew with Guinness with either potato dumplings or soda bread. For dessert I do an Irish Coffee Pie or a Guinness chocolate cake. I prefer Killians Irish Red beer if we are having beer with the meal. After dinner, I always serve Irish Coffee. It is a wonderful way to end the day. We decorate a bit and put on Irish music. The the kids were young, we would watch Darby O'Gill and The Little People. I am glad to see Irish characters Irish events, and Irish setting in your books. They rarely make an appearance in Regency or many other romances. Thanks for sharing, Patricia. I think I should have you plan my next birthday party!